My kids always have something that is personalized at their birthday parties…always. In fact, they ask for it. Last year I thought my son was too old, that he would think it was hokey…BUT I was wrong! So, when I started thinking about what I was going to create with my Elmer’s Painters Markers personalized birthday party décor was tops on the list. Well, my kids birthdays are a bit a little ways away, but my daughter’s friend’s birthday is this weekend. I could not resist pulling something together for her (with her mom’s permission of course!). I had tons of ideas for centerpieces and photo displays…but I really wanted to try something a little different with the Painters Markers. BUT ended up loving the colors! and you can choose from medium or fine point. This is new to my Walmart! Ultimately, I decided to make a personalized pennant with the birthday girls name and a memory book. What is so different about that you may ask…. This project is done while wet. Why wet? Most of the time when I use Painters Markers I use them for their clean crisp lines, but mixing them with the watercolors/inks on a wet surface shows the softer side of Painters Markers…wait until you see it!? I am in love with the effect! Before I go on, you need a little back story and inspiration behind this idea. One of the teachers at my daughter’s preschool is also an amazing local artist. Her name is Josie Cameron and she has a whimsical colorful style that makes me smile. She creates magical pieces of art and every day at preschool, one lucky child gets to bring home a piece of here artwork as the cover of the “child of the day” book. The preschool has a “child of the day” This child is responsible for bringing snack, leading the class in various activities, etc. The other children each draw a special picture this for the child of the day and gives a sentence or two about the picture. The child of the day then gets to go home with a beautiful book full of pictures and stories form her classmates. The books are put together by Josie and she creates a beautiful, unique cover for each book…we save all of these books…they are so pretty and Jules and I love reading what the kids have to say. I wanted a banner that reflected this style and I wanted something different. Josie’s ideas sent me in a whole new direction. Josie’s style is so vibrant that I enlisted her help and creativity to create a custom pennant for the birthday girl! So, really we…I…have to give credit to Josie Cameron for this beauty! First, since you will be working with dyes and ink and water, I highly suggest using an old plastic table cloth or other durable or protected work surface, and possibly gloves when doing this project. I actually used a plastic shoe box and worked in my sink. Any of the Painters Markers color will work, you will need to experiment thought. We loved the Neon Painters Markers because their color is so bright. It was also combined with some of the Craft colors. This book is basically a take off of the child of the day book, just revamped into a Birthday Girl book, where the kids can draw a picture and tell the birthday girl a story or wish. In a cup of water, add a few drops of liquid water color/ink/diluted paint and mix. Use the brush and paint all over the front and back covers (card stock). Let dry slightly between layers. Continue to add color all over or in a ombre effect or in the corners – bow ever you wish. THERE IS NO WRONG! Adding layers of color will create depth and variations in color. As the cover dries, use the Painters Markers to write the Birthday girls (or boys) name. Add embellishments using various colors of Painters Markers…like the polka dots on the letters. NOTE: If you use the Painters Markers while the page is still wet, you will get a softer blended effect on the name and details. You can wait until the cover is dry for a crisper look. Punch holes in the cover and insides papers; insert blank pages inside; thread one length of ribbon through each hole and tie. I just happen to love pennants and banners…and so do the kids. They love seeing their names in big bright letters. Cloth triangles (double for each letter). Mine are cut out of a washed/bleached drop cloth. You can purchase premade triangles or make them out of a 100% cotton fabric. Ribbon, long enough to sew all of the letters on the ribbon with about 18inches of extra length on each side. Cut fabric triangles (approximately 8 inches along the top and 10” long in the center). If you cut the triangles alternating up and then down, matching them up along the sides, you can fit a lot across in a single row. If you cut them with the fold on the top of each triangle, it takes more fabric, but you get a uniform edge along the tops of the triangles. In a tub or tubs of water – depending how many color you would like - add a few drops of liquid ink/water color/dye and mix thoroughly. This shows the yellow ink...the rest of the tutorial shows green. Dip each triangle into the desired color, let soak for a minute or so. remove, squeezing excess water. The first one or two may take a minute…but then it gets quick! You can do a few at a time. Lay each one out on the protected work surface and a few paper towels. While the fabric is still wet, use the Painters Markers to write the letters of the birthday girl’s name. Just freehand the letters to make it even more personal and whimsical…or if you really want you can copy or trace letters from your favorite font from chipboard letters to copies from the computer. Embellish with dots, circles, stripes, squiggles, etc., all while wet. I mainly made dots…If you press down for a few second the dot becomes a larger softer circle, a quicker pressing of the Painters marker gives you a smaller o more defined dot. Outline the circles/dots with another color, add more dots..It is up to you and your imagination! Add touches of glitter paint if you want some sparkle! 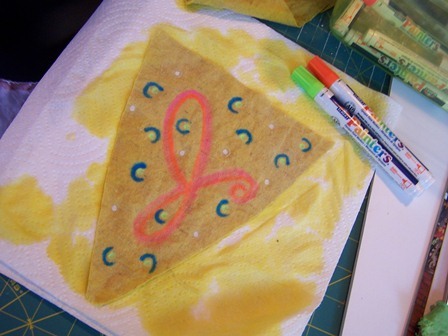 I used a fabric glitter paint and brushed it on here and there…you can brush it on all over the pennant piece too. Iron to heat set the Painters Markers after drying. OPTIONAL – stitch around each triangle to prevent any further fraying. I often do this, but for this pennant I actually preferred the way the triangle looked not sewn together – it is a personal design issue. Start sewing the ribbon to the triangles. Place the triangle on top of the ribbon with the ribbon edge and tops of triangle matching up. I use a zigzag stitch to quickly attach the two. I love the fact that a local artist had a hand in creating this personalized banner and has totally inspired me to try a new way with the Painters Markers! and of course check out all of their offerings o the Elmer’s website. A BIG thanks to Josie for her artistic and creative talents! Have you ever used Painters Markers? What do you want to create today???? What a fun and festive project! I love the blending of the colors. That is all so pretty Holly!! I love how colorful it is and I would never have thought of using the paint wet! That is so clever! Those are the cutest birthday decorations - love them! I love the idea of using the Painters wet - never even thought of that! !